The Imitation Game - Movie Review - Are You Screening? 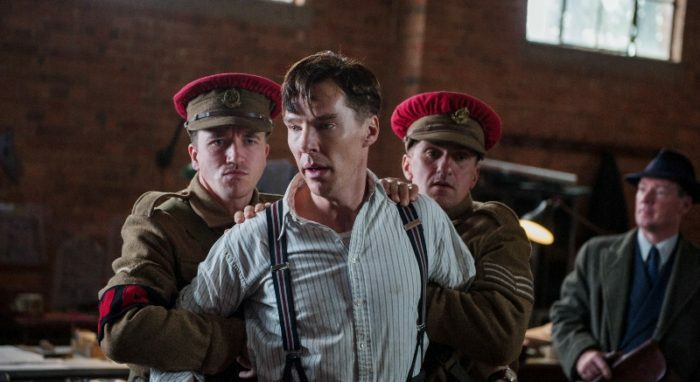 You aren’t begging for people to fill seats by taking on the life of Alan Turing, but The Imitation Game manages to deliver an almost bizarrely engrossing story. It’s so deceptive that attempting to convince a broad enough audience that they’ll be entertained is as challenging as the Enigma obstacle Turing faces in the film. 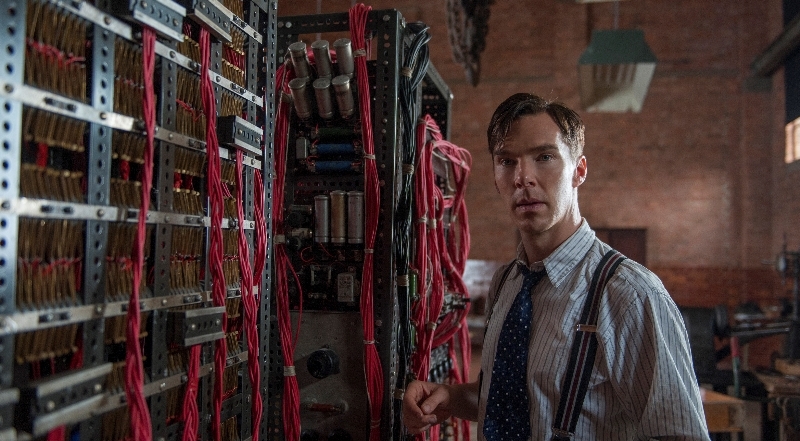 Benedict Cumberbatch plays Turing, and we enter the film shortly before Turing applies to work for the British Government. Actually, we enter the film long after the war is over, as Turing runs into local police, and he begins telling his story… which begins shortly before he applies to work for the military attempting to crack the infamous Enigma code. Turing, and hopefully this won’t spoil the movie’s end-caption explanation of what follows after its own timeline, more or less invented computers, the predecessors of which were known as Turing machines. One of the most fascinating, and unmentioned, aspects of his life is that if it weren’t for the war, he may not have been moved in this particular direction, and the entire world of computers may have been a couple of decades behind. Focusing in on this several-year span of his life, we watch Turing join in the military’s work, but in the particular style of a genius who is far enough off the charts that his social skills are severely lacking. When faced with the other “best minds in Britain” that the military has assembled, Turing is dismissive of their abilities, and makes no effort to actually work with them. One of the film’s standout moments revolves around Turing’s inability to get lunch, because it requires interacting with the team he is supposed to be a part of. It’s solidly honest, painfully real, indicative of the general flow of his life, and probably actually happened, and more than once. 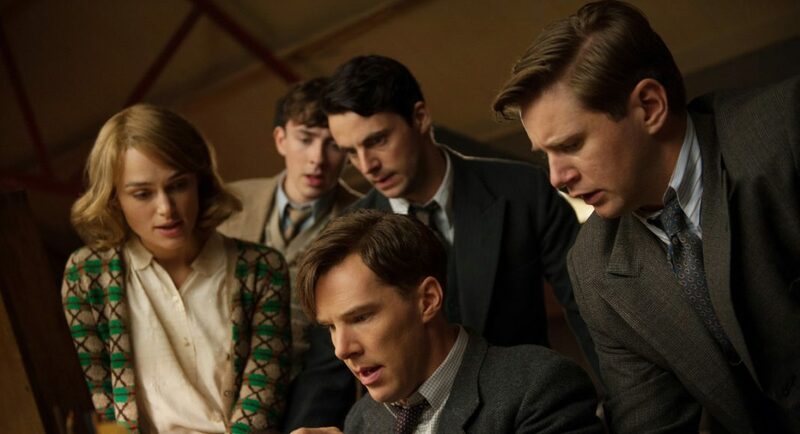 Determined to overcome the problem, but convinced that his idea is the only true possibility, and that they need better, different people, Turing turns to a recruitment effort, which brings Joan Clarke (Keira Knightley) on board. This, given the time, leads to the expected difficulties, but the movie does a good job of relaying the situation, as opposed to snatching the opportunity to grandstand about the issue. As the program moves forward, we get the key stages of success, failure, and overall difficulty, interwoven with moments that provide surprising clarity of the situational frustration that made up the lives of the entire group. Stuck in a room, repeatedly failing, and having that failure result in unimaginable loss of life. Couple this with the bureaucracy involved in getting things done in the way that will work, as opposed to the way that takes ten more years, and it’s hard to imagine they all didn’t go crazy. Delivering an appreciation for this, which is really a sideline theme, tells all the film needs as far as the ensemble effort and directing are concerned. The film’s best note would potentially spoil things to a degree, but it comes once the group finally hits on a solution to the Enigma code (which I hope we all knew was coming). Indicative of so many of the film’s moments, Turing’s reaction and response are perfect for the character we’ve been given, which just continues to pull the audience in. The film avoids the stereotypes (with perhaps the exception of the commanding officer) and “lesson-worthy” moments that could have easily derailed it, all while forced to balance characters that are so ripe for cliche. Spies are like this. Geniuses are like that. Reactions to a woman who might intelligent are such and so. Well, that last one doesn’t quite come off without a hitch, but there is a case where reality and simple-seeming scriptwork stare blankly at each other. This ought to be enough for any film, especially when the entire cast ought to get an award, but what pushes The Imitation Game over the edge into greatness is the mind-boggling number of sub-pieces that are in play, with some of the only hinted at in the most minor way. It isn’t just that we have to deal with the fact that Turing was gay, but it’s the way that it doesn’t need to take over in order to afford it the weight of a meaningful, relevant facet of our overall character. While there is much about the man to deliver, we don’t quite mention the fact that there is something Holmesian about him, though it dances there in the background. Not simply in a genius way of approaching the world, but in the sense that without the proper puzzle to focus on, we might find him passed out in a corner of his flat. We’re in a world where movies are longer than they need to be, largely based on some idea that good movies are long, so we better add some more. This one pulls everything together into a film that is just under two hours, and makes you feel you wouldn’t complain if it were an hour longer. With everything else, that makes this easily one of the best of the year.